World Dance IV is the fourth in my series of small, unique books that portray dancers around the globe. It is currently in Celebrate! an international juried exhibition of contemporary artist books celebrating food, music and dance at the Anderson Academic Commons on the University of Denver campus through June 25, 2017. The exhibit was juried by Sha Towers, Art Liaison Librarian and Director of Liaison Services at Baylor University and curated by Alicia Bailey of Abecedarian Artists Books. This book follows my interest in the beauty and drama of dance and its universal application. In our turbulent world, dance keeps us alive and human. 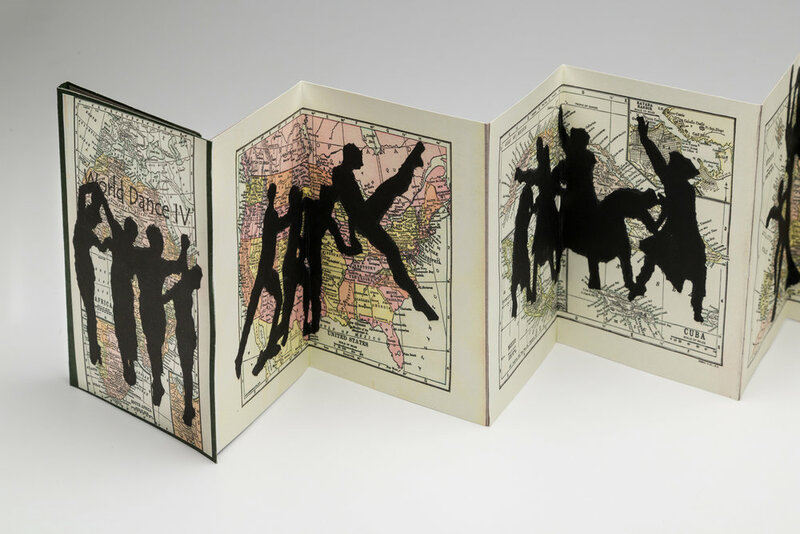 I used vintage maps for their color and history and torn paper silhouettes of dancers to accent parts of the global story. The dancers and maps are fashioned accordion style for a feeling of movement and flow. I used simple material, such as an old file folder as the cover and a fabric tie to simulate a log book or captain's journal. The entire exhibition is in a full color catalog with artists statements, descriptions and bios available at www.lulu.com for $25.00 plus shipping.